Put on your dancin’ shoes and lederhosen and celebrate all things German including beer, bratwurst, and oompa! 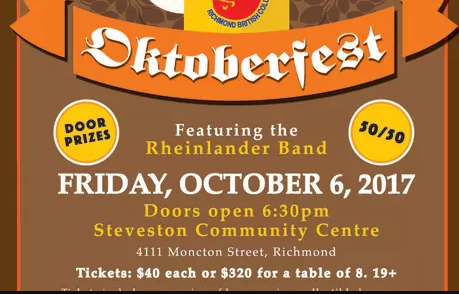 Tickets are available in person at the community centre, or by phone 604-238-8080 for pick up at your convenience. Doors open at 6:30pm; dinner served at 7pm. Dancing at 8pm.